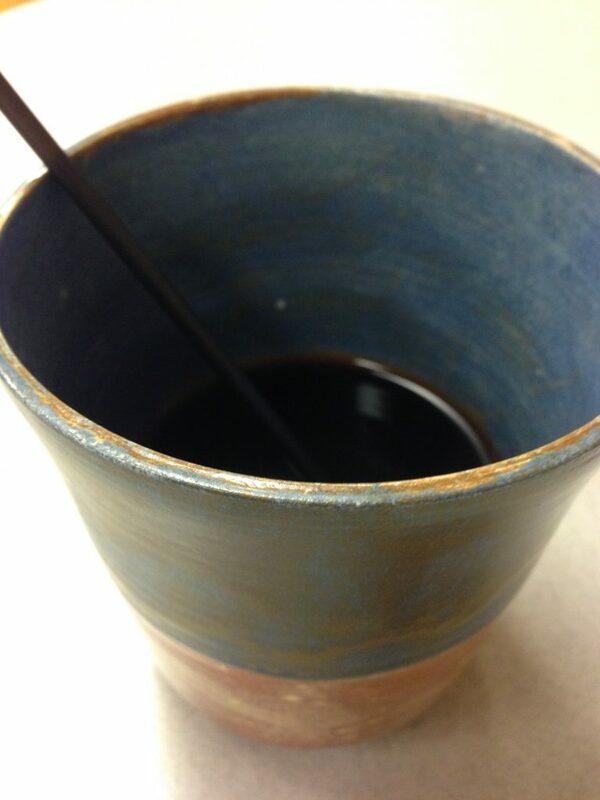 Well, I had the most fortunate opportunity to have Tom Steiner make me a French Press coffee. I have to admit I was familiar with the French Press but I really never wanted to take the time to buy one and try it out. It just seemed like more equipment to store. Tom and his wife owned and operated the Blue Bottle Coffee Shop in Muncie Indiana. They eventually sold the business but at one time the location was in the village of the Ball State University campus from 2001 to 2004 and eventually downtown Muncie. His shop was one of a few local coffee shops in the area. Tom is currently a business coach and has an office down the hall from me. He enlightened me one morning in the breakroom about French Press coffee. 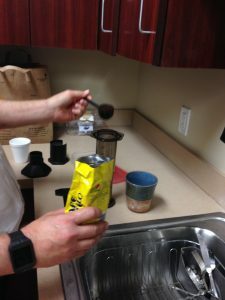 “The coffee texture is ground finer than regular coffee but not like an espresso.” He compared the different grinds of the Folgers we have in the break-room vs. his coffee he brought for the press. He explained that there would be a smoother taste with the French Press (he was right!) After a few minutes I realized I had very little knowledge of coffee. He continued to tell me the various types/styles of coffee makers. At this point I’m completely amazed at what I didn’t know about coffee…I mean how much is there to know right? 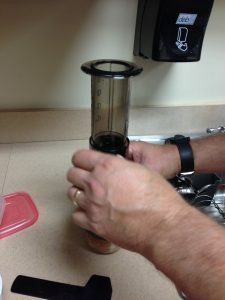 The base of the Aeropress over the cup. 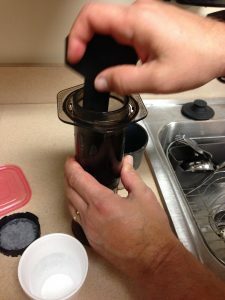 Inserting filter and top portion of the Aeropress. Adding the coffee to the Aeropress.. Stirring the coffee and water to release flavor. So what’s the difference between the French Press verse Aeropress? Tom explained that water is very important in the coffee making process. Water should be filtered especially for a drip brewed coffee. And if you use an espresso machine you need soft water. 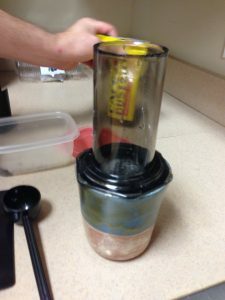 The minerals will clog the machine because the tubes in an espresso maker are smaller but it also changes the flavor of the coffee. He also points out that coffee made here verse Chicago will taste different because of the water. Filtered Water – taking the chlorine and other minerals out will leave room for more coffee flavor. The grind of the coffee is also important. The finer the grind the more coffee flavor you will extract. Espresso is a very fine grind and stronger because of this. 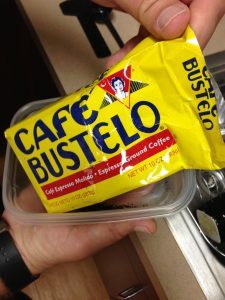 Residue on your coffee maker will affect the flavor. He states that everything needs to be very clean, even the coffee cup. I need to point out that the Aeropress coffee he made me this morning was placed in a handmade coffee cup because he refused to use the styrofoam that was in the breakroom. When we ended our conversation Tom pointed out….”When my wife and I get up in the morning it’s not…do you want coffee? It’s what type of coffee do you want?” On that note I asked if we could discuss this in a further interview. I’m betting I might get another cup of great coffee out of this! !